I’ve recently noticed that I’ve been not-noticing something, and it surprised me quite a lot. I’ve been not-noticing the music in Valve games — in Half-Life 2 and Portal 2 specifically. This surprised me, because these games are excellent. Perhaps excellent enough to make me concentrate on the gameplay and forget about the music. The theory on film music is that when it’s doing its job you shouldn’t notice it much. Its job is to make you feel what’s on the screen, so if it draws attention to itself, it’s doing it wrong (massive generalisation, but fairly accurate for mainstream cinema). I understand Claudia Gorbman’s Unheard Melodies: Narrative Film Music (1987) discusses this, and the concept has passed into common film music parlance. I guess we assume this is also the case for video game music, though that might just be another left-over assumption from film music studies (should look into this… thesis chapter potential?). Whatever was going on, I’d certainly overlooked the music in these games—perhaps I was too busy being entertained by a talking potato. My moment of realisation came when, as I do about once a year, I loaded up my second play-through of Half-Life 2. For some reason I decided to play through the game again before attempting the Episodes, and I still haven’t got through it. Anyway, I was fanging the hovercraft around a bend and the music started up and I thought “Wow, how on earth haven’t I noticed that music before?” It’s incredibly subtle, electronically precise like most of the Half-Life sound experience, and rather emotive. The Half-Life game world is one of the more sparse and ambient worlds in gaming I feel, and the music suited it exactly, giving its usual emotional direction without hindering the player’s ability to usefully employ their sense of hearing. Perhaps as a result of my Half-Life 2 revelation, I began to pay more attention while playing Portal 2 and was similarly surprised. The obvious points of musical interest in the game are finding “Exile Vilify” by The National playing in a side room and the game’s credits song (which could only disappoint after “Still Alive” in Portal, but is still pretty good). But the score is both eerie and crisp, often showing a similar precision to Half-Life 2 but haunted and a little disturbed. I think it matches the game’s myriad tensions: Aperture’s past(s) and post-apocalyptic present, an awe of discovery (testing!!) muted by nervousness, two antagonistic and psychotic artificial intelligences, and of course the interplay between intelligence and movement upon which gameplay relies. Even the multiplayer has a more light-hearted, sociable treatment of the same musical mentality. But all of this is very subtle, and more so given that the score is juxtaposed with un-subtle music—”Exile Vilify” is a prime example, as is the jazz version of “Still Alive” that plays over the radios, but even the “sound effects” for using Gels and Aerial Faith Plates (and probably other things) are actually musical cues that actively modulate to match the current background music (even mid-cue!). All in all, its an intensely musical game, but it’s just rather quiet about it. I’m a little ashamed I didn’t pay attention to these excellent scores on my first play-throughs. 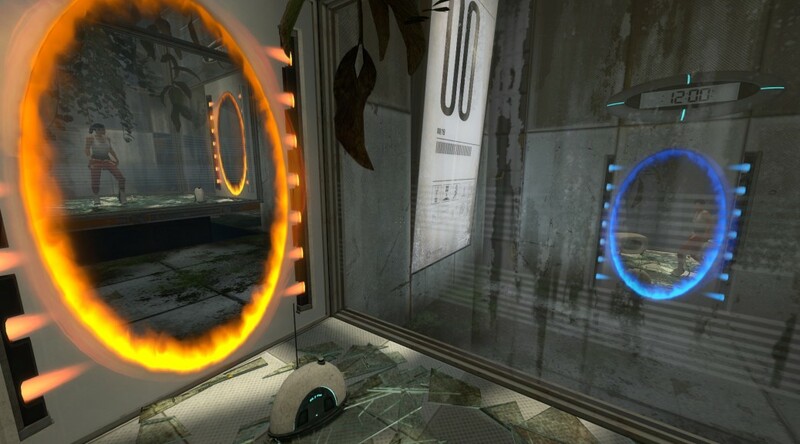 Both Half-Life 2 and Portal 2 have a multitude of innovative or just plain excellent elements that usurp players’ attentions, so it’s not my fault; and besides, who isn’t distracted by the surprise of a good sequel? But maybe Valve has silently found the formula for that holy grail of video games — music that works so well and so subtly that it never gets boring, and thus avoids being indelibly stamped upon your consciousness in a bad way.